We are Dutch and also speak English, Italian, German and some French. You can write us or call us in English. With our Infobook about Apulia you will find the beaches on both coasts, de best restaurants en de nicest places to visit and some activities.The book will be your guide in Apulia and you do not need to prepare for the holidays anymore. Villa Lavanda is situated in the countryside of Apulia at 55 km. from Bari airport and a bit over an hour from the airport of Brindisi. Very centrally located to explore a big part of Apulia and even Matera in Basilicata. Matera is the European Capital of Culture 2019. Ryanair has direct flights from Dusseldorf-Weeze, Brussels-Charleroi, Maastricht-Aachen, London, Dublin etc. From Amsterdam and many other cities with Alitalia and also from Amsterdam direct flights with Transavia. The first floor is reserved for our guests with 2 bedrooms with a double bed and 1 room with a half open kingsize boxbed and a single bed. You always have a private bathroom. The rooms, beds, pillows and bedlinen are kept very clean as you can aspect at a better B&B. We have a guest lounge with Dutch and Belgian TV (everything in the original language, so much is in English) and the international news channels, free coffee and tea, a fridge/DIY bar with drinks and snacks and tourist information. Free Wi-Fi in and around Villa Lavanda and parking on the premisses. For all guests there is the use of a robe, slippers, a blow dryer in the bathroom and a picnic basket to take along. Herein you will find a picknick blanket, beach towels and all the necessities for a picnic. Even folding chairs can be borrowed for your trips. 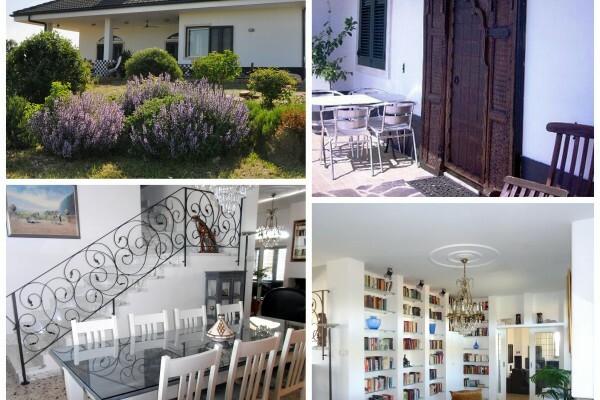 Villa Lavanda as in its name, is surrounded by lavender, an herb garden, a cactus garden, grapes, that we use to make a delicious marmalade de for your breakfast, and many other beautiful plants. Also 2 ponds. On the 3 porches you will always find a nice spot with a book and a drink and on the covered veranda we usually serve breakfast. At Villa Lavanda not your usual Italian breakfast with only sweet stuff. We are known for our extensive and varied breakfast with i.e. cheeses, eggs, meats, yoghurt and fruit. We like to take good care of our guests in the holidays before they start the day, whether it's here, to one of the many beaches or visiting the most beautiful places in Apulia. The flights from Maastricht, Dusseldorf-Weeze and Brussels-Charleroi take 2 hours and 20 minutes and with the use of robes, beach towels and the possibillity to do laundry here to run it is also possible to travel with hand luggage only. Thera are also daily flights from London and several German Cities en France to Bari. From Amsterdam you can fly with Alitalia, Transavia and Swiss Air. See our website for more information. Every day there is a beautiful sunset, but the stars and the moon are much more visible and more beautiful than in Northern Europe. Look at this with a nice glass of wine at hand and watch the owls and bats do their evening hunt. We have bikes that you can rent and we have hiking – and biking intineries. From 3 nights you get a progressive discount over the whole stay and early bookers (6 weeks) get many free extra's and options. See our website. the Pugliese kitchen: a hands-on cooking workshop. E-bike tours to those special places where you might not come otherwise in combination with a demonstration of a local product and tasting it. Dolphin spotting with animal protectors from Taranto in the Ionian Sea. This is so in demand that it's wise to book that long before your arrival. Hiking excursions in land- and sea nature reserve Torre Guaceto, where they cure seeturtles and you can do birdwhatching. Also in the salt pans of Santa Margarita di Savoia bird whatching excursions with e.g. flamingo's. This room has a half open kingsize boxbed and a single bed, a sitting area and an en-suite bathroom with shower. Possibilities of this room: 2 people sleeping in box bed. 2 people using two beds: € 10.00 per night surcharge. A 3rd person in single bed: supplement € 34.00 per night. Also on the surcharges a discount from 3 nights. The view is on the Apulian fields and farms. With a very special double bed. Nice bright room, lots of closet space, sitting area, original art and decorations. En-suite bathroom with shower. View of fields and farms. A spacious and unique room and beautifully decorated with original art. In the bathroom you will find a bath tub and a shower. View on the antique grainmill and Masseria La Mandra. All rooms have air conditioning and heating, are fresh and clean, and there is also a fan available. All rooms have new very good matrasses. Smoking is prohibited in Villa Lavanda, but on the veranda smoking is permitted provided it does not interfere with other guests. All rooms are equipped with a smoke alarm. Green Papaya: costs 86 euros per night for two persons. For single use a discount of 10 euros per night. Mt. 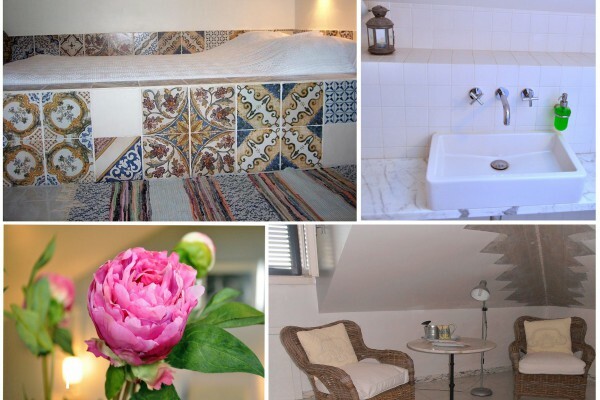 Lavinia: 96 euros per night for 2 persons. A Room With A View: 96 a night for 2 persons. If two people use two beds there is a surcharge of 10 euros per night, and a 3rd person sleeps in the room there is a surcharge of 30 euros per night. Renting our bikes cost € 10,00 per day per bike or part and you can use our washing machine including detergent and ironing equipment to for € 5.00 per wash. Use of the washdryer costs also € 5,00 per wash. There is a € 100,00 guarantee. A progressive discount on the whole stay from 3 nights. This discount also goes for the surcharges for the use of 2 beds or a 3rd person in ARWAV. Arrangements: on request hands-on cooking lessons. Independant English speaking guidance buying a house in Apulia. Included extensive and varied. With the booking confirmation we will send you a form where breakfast preferences can be specified as well as the measures of the robe and slippers. Breakfast can be served inside or outside, as you wish, and is normally used between 08.00 and 10.00. If you want to make an early excursion or have an early flight, we obviously will serve you an early breakfast. There are a lot of restaurants in the neighborhood, from very simple to slow-food. We only provide breakfast. On the same private road that leads to Villa Lavanda you can also find the Agriturismo. Here you could enjoy a traditional Puglian sunday lunch. At 1,5 km another Agriturismo restaurant where you can eat Friday nights, Saturday for lunch and dinner a la carte and on Sunday a lunch with a set menu. can be rented for € 10,00 per day (part) per bicycle. Good locks and panniers are available. We are also working on the translation of our biking- and hiking trails. This is difficult because we ourselves have dogs and cats. For a special case, you can always contact us, because we are definitely animal lovers. Not inside or in the rooms. We have smoke detectors in the rooms. Outside on the veranda is allowed, provided it does not interfere with other guests. Not for wheelchair users, but we have easy steps that are not steep at all. Free Wi-Fi throughout and around the house. In our new guest lounge Dutch TV (everything in the original language) and the international News channels + free coffee and tea, a fridge/DIY bar and touristic information. 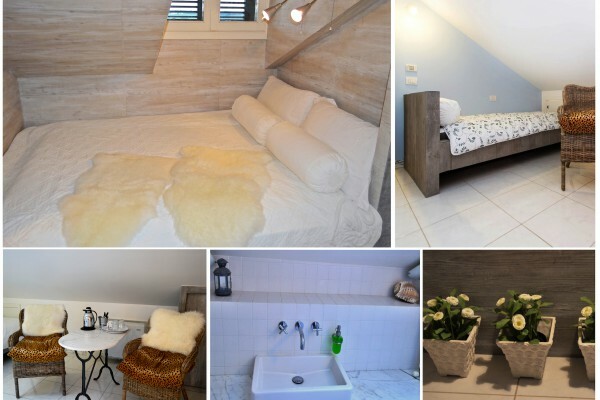 Geweldige kamers allereerst! Heel fijn om een eigen badkamer te hebben. Wanneer ik ’s ochtends beneden kwam was het ontbijt opgediend. Ik voelde me als een koningin en begon de dag zo heel relaxed. Jenny is een erg aardige vrouw die perfect Italiaans spreekt en omdat ze hier al zo lang woont heb ik niet eens verdere research hoeven doen om te bedenken wat ik kon gaan doen in mijn dagen. De Trulli zie je daadwerkelijk overal! Dat is erg leuk aan deze streek, zeker de moeite waard om te bekijken, vooral in Alberobello. Die plaats is erg dichtbij en echt heel erg leuk om een dagje te bezoeken. Ook heerlijk om even een dagje naar het strand te rijden! Trullis everywhere, Bari airport and good beaches. 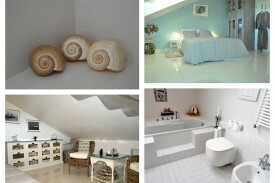 Did you stay in B&B Villa Lavanda? Let us know what you thought about it and help others to make the right choice! * I confirm having stayed in B&B Villa Lavanda. Find other bed & breakfasts in Noci or all bed & breakfasts in Apulia.